Now with two locations in Matthews and Waxhaw! Moe's Original Bar B Que is a Southern Soul Food Revival. 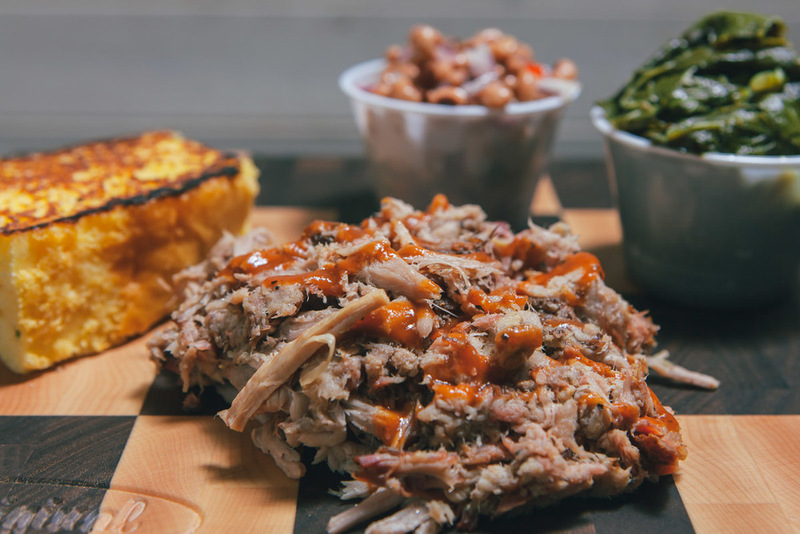 At Moe's Original Bar B Que, our menu features high quality smoked meats paired with an ample rotation of traditional Southern sides and desserts. Every bite is prepared fresh daily, using tried-and-true recipes that have been passed down for generations. Our bar features 14 local and regional craft beers on tap, bottled domestics and wine. We also offer full service catering for any occasion; from business luncheons and special events to parties and weddings of all sizes, we've got you covered. Whether it's at our place or yours, Moe's Original Bar B Que is the perfect choice for families and friends who want to get together and enjoy some quality ‘que served with a big ole' helping of Southern hospitality. Our signature wings are marinated and smoked, then fried - served with celery & Alabama white sauce. Freshly chopped and topped with one meat, dressing, cornbread & a drink. Pulled smoked pork topped with BBQ sauce & pickles. Pulled smoked chicken drizzled with BBQ sauce, Alabama white sauce, marinated slaw & pickles. Smoked turkey breast, sliced thick, then dressed with BBQ sauce, Alabama white sauce, marinated slaw & pickles. Smoked Tofu topped with BBQ sauce, Alabama white sauce, marinated slaw & pickles. Fried catfish fillets, tartar, marinated slaw & pickles. 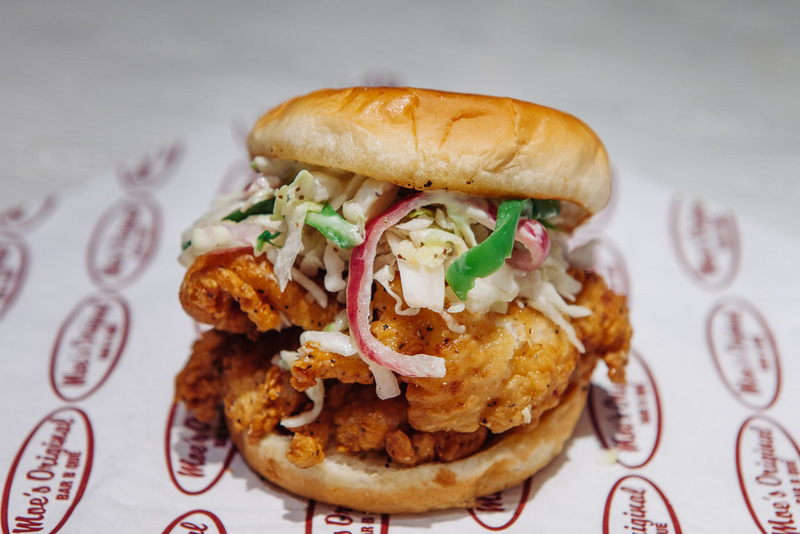 Fried shrimp, tartar, marinated slaw & pickles. Served with two sides, cornbread and a drink. Pulled pork, BBQ sauce & pickles. Half a smoked chicken, pulled or on the bone with BBQ sauce, Alabama white sauce & pickles. Sliced smoked turkey breast, BBQ sauce, Alabama white sauce, pickles & marinated slaw. Southern fried catfish fillets with our homemade tartar plus your choice of hush puppies or cornbread. Marinated wings, smoked then fried and served with celery & Alabama white sauce. St. Louis-style pork ribs served with griddled cornbread & two sides. Choose any 3 sides, served with griddled cornbread. served with one side and drink. Got a crowd of hungry mouths to feed? Whether it be a luncheon, corporate event, wedding or family function, we'll customize a package to fit all of your needs. We offer pick up, delivery & full service catering.Call our catering line or fill out our form below for details and pricing information. Copyright © Moe’s Original Bar B Que.